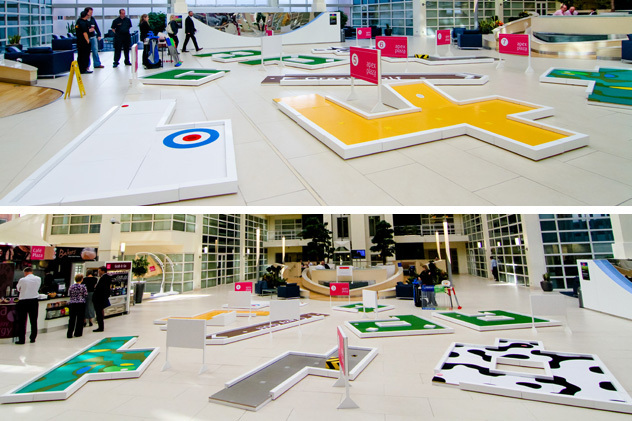 Our brand-new, spectacular ‘Signature Course’ is now available for event hire. 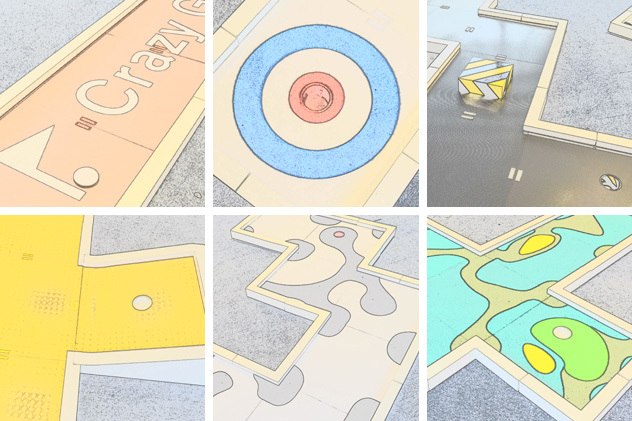 Conceived and created by UrbanCrazy’s Jon, Dave and Kate this year, the course comprises interestingly themed holes, including: ‘DreamGolf’; ‘Hazardous’; ‘BrownSign’, ‘Studded’; ‘CrazyCow’ and ‘Target’. 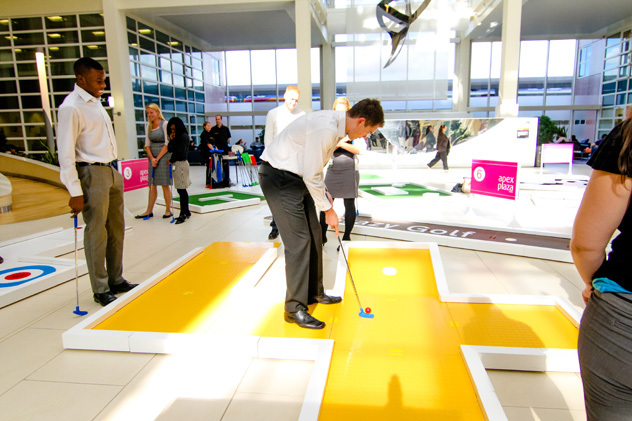 To pinch an old Carlsberg slogan, we reckon it’s probably the best portable crazy golf course in the world! One of the great things about this course is the quirkiness of it. 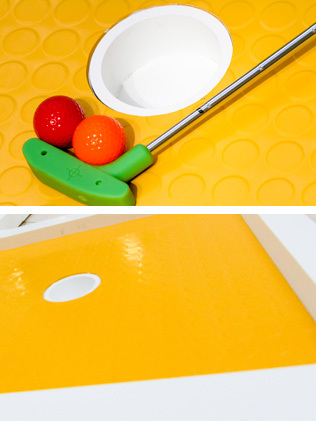 Many of the surfaces are unconventional, combining contrasting materials, textures and aesthetic appeal. 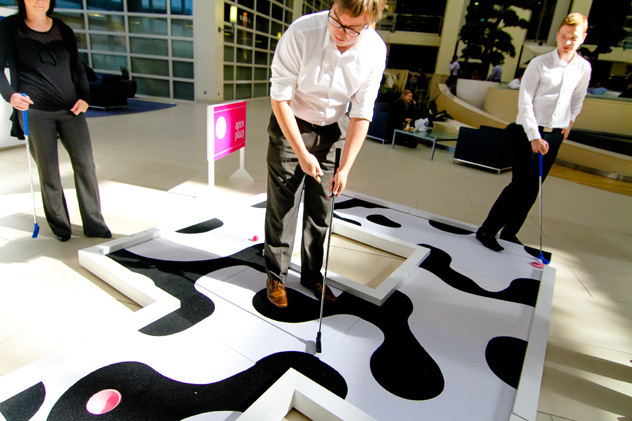 Take our ‘CrazyCow’ hole for example. 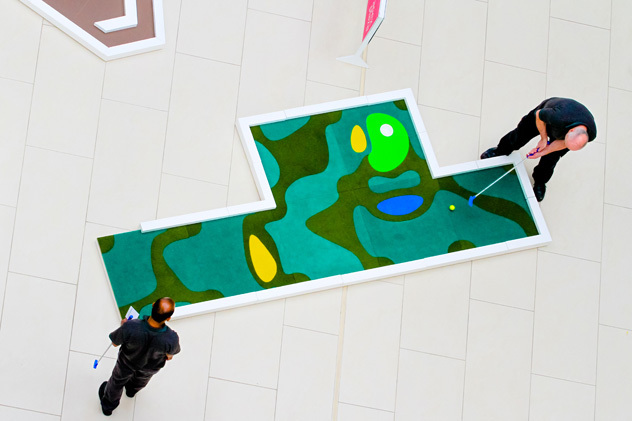 A smooth white scruff-resistant surface and black minigolf carpet come together to create an unusual effect. 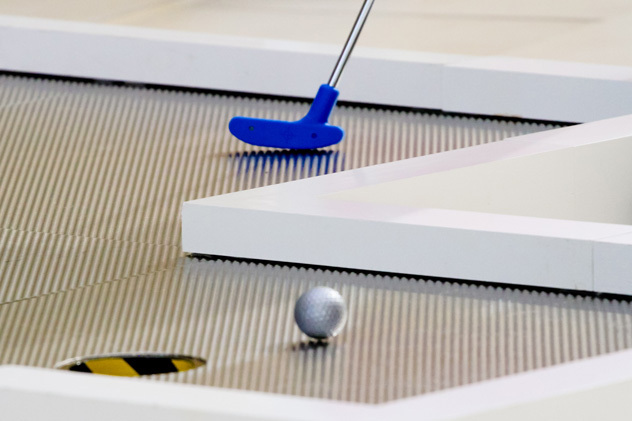 The bumpy metal sheeting on our ‘Hazardous’ hole will dazzle you whilst presenting a real challenge as you attempt to send the ball in a straight line. 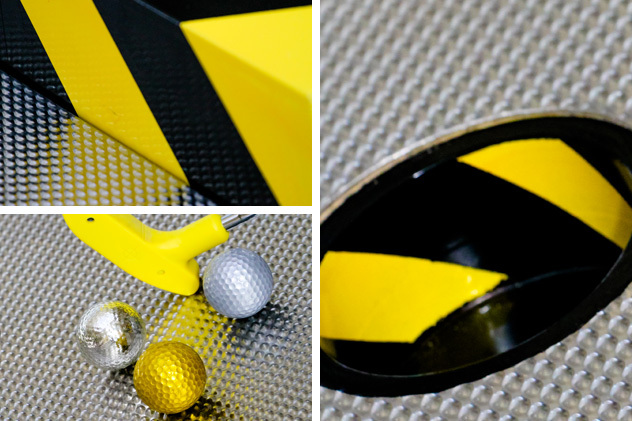 A difficult enough task without the black and yellow hazard-striped obstacle that guards the hole! Other units in the range include ‘Studded’ which, even if you are able to negotiate the raised yellow rubber studs will still leave you a jeopardous putt up the ramp. 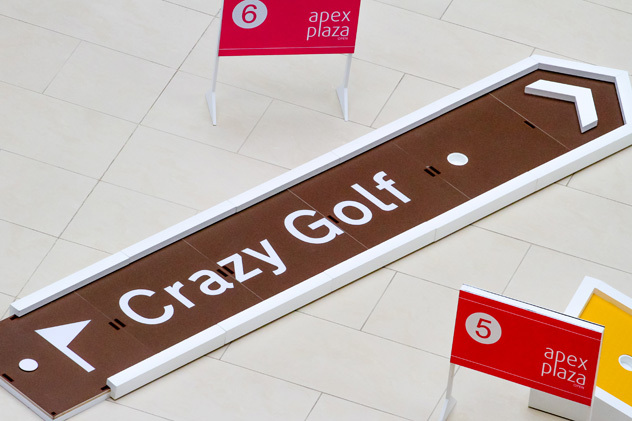 And how about our ‘BrownSign’ hole, inspired by the UK’s many roadside tourist signs. 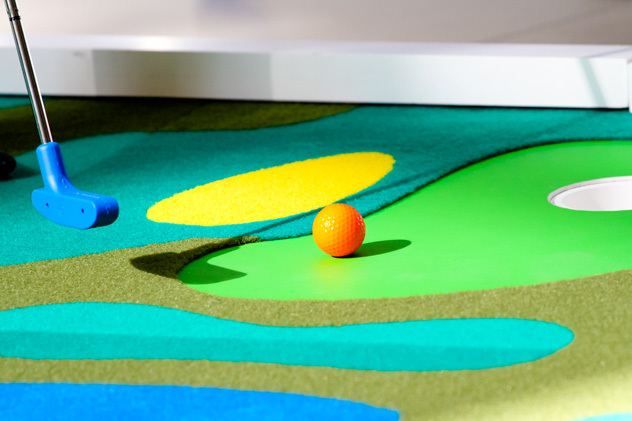 Our ‘DreamGolf’ hole includes representations of fairway, rough, sand, water… and a putting green that plays faster than the tightly mown greens at St Andrews! Finally, our ‘Target’ hole will run rings around even the most experienced golfers since the cup is protected by blue, white and red hoops of uneven heights. 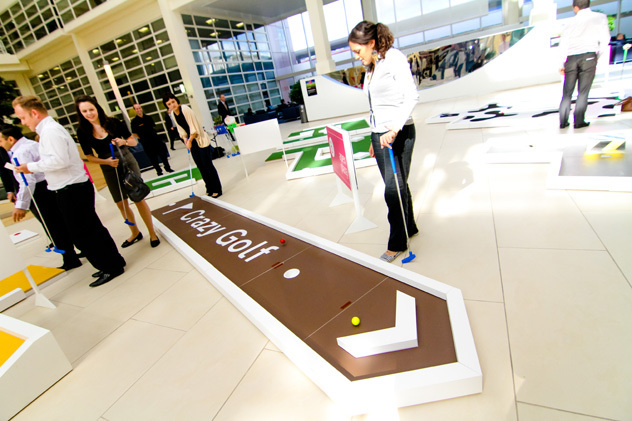 The ‘game play experience’ is certainly unlike anything you’ll have ever tried before! 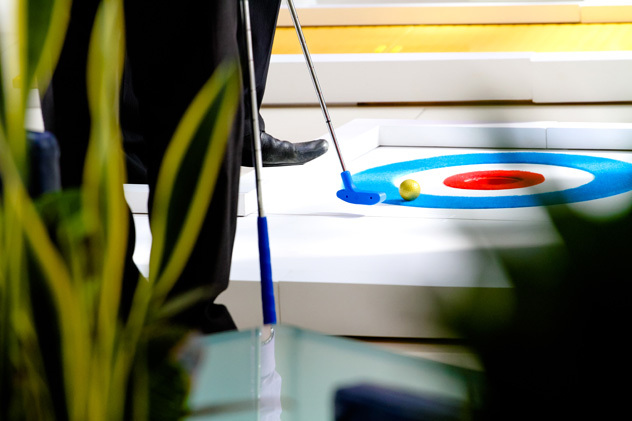 We assemble the course at your venue in sections so virtually all the holes can be set up in a new configuration each time. This means you can be sure the layout won’t have been repeated at a previous booking. The course is entirely exclusive and original. Perhaps even a little eccentric! It will enhance occasions as varied as: top-end business functions; TV shows; festive events; swanky weddings; exhibitions and launches. Essentially, any event where a really high impact is called for. 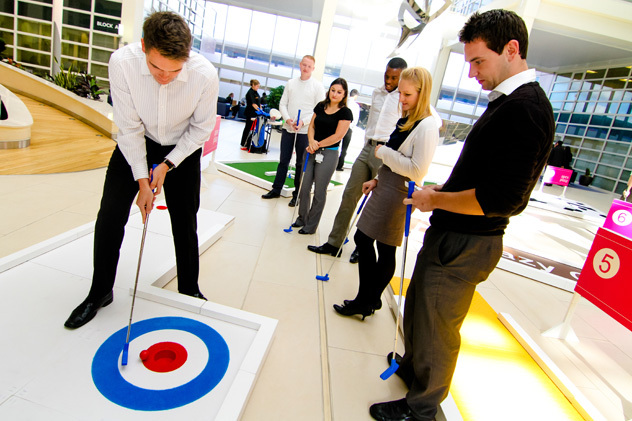 We take pride in our service and as always can supply putters, colourful balls and other accessories, plus a crew of engaging staff to supervise the activity and see that all your guests have a jolly old time. 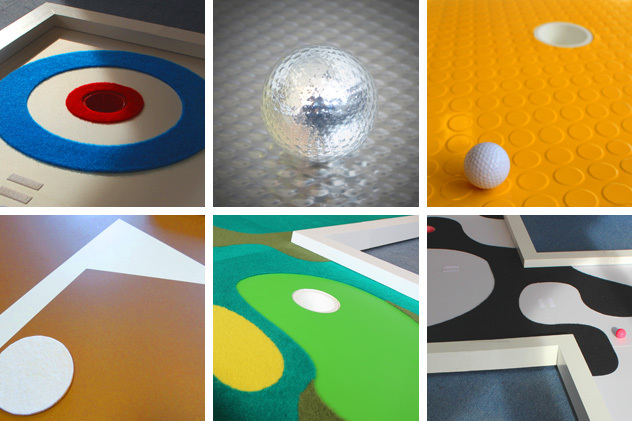 We also specialise in personal touches like bespoke scorecards, branded tee stands and other decoration. Do take a look at the photo gallery (top right) to see what we can offer. If you like what you see simply get in touch, tell us all about the event you are planning, wherever you are in the world, and we’ll get right back to you to advise on availability and prices. We very much look forward to serving your event soon!